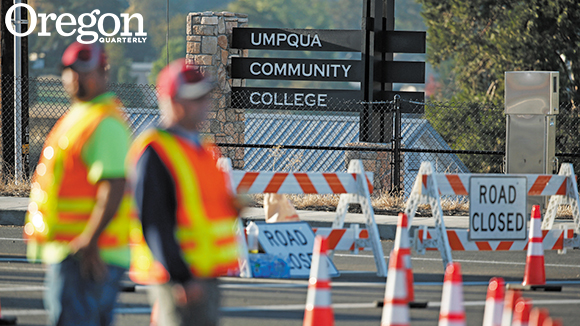 Within hours of the mass shooting at Umpqua Community College last October, four members of the University of Oregon’s Incident Management Team arrived on the UCC campus in Roseburg, about 65 miles south of Eugene. This highly trained team is coordinated by the UO’s Emergency Management and Continuity Program and stands ready to help when something goes wrong—either at the UO’s own campus, or at another institution. Operating outside the media spotlight, Incident Management Team members spent five days at UCC, providing logistical, business, communications, and management leadership that allowed the institution to continue to function. For much of that time, 12 UO employees worked full-time at UCC. The team then handed over operations to an executive team from Lane Community College, which kept UCC running while Umpqua’s leadership focused on their community’s grief and trauma—and their own. Le Duc is an expert on how to move forward in the aftermath of disasters. He founded the Disaster Resilient Universities e-mail list serve, a source of information and catalyst for conversation for his counterparts at other colleges and universities. The list has more than 1,400 subscribers. He has also put forward a plan to get educational institutions across Oregon to help one another in preparing for and recovering from disasters. While government agencies often take the lead in the minutes and hours following a shooting, severe storm, explosion, flood, or other catastrophic event, there is no agency designated to help get academic, research, and business operations up and running once the initial danger is over. In the case of UCC, logistical issues in the aftermath of the shooting needed to be addressed with professionalism, thoughtfulness, and care so that the college could eventually return to teaching and learning. And when things go wrong on campus, there are important details that are beyond the purview of first responders. For example, when law enforcement closed UCC after the shooting, more than 300 cars and countless backpacks, phones, and other personal items had been left behind on campus. An organized effort was needed to return those items to their owners—all of whom would have to return to a place where they had experienced trauma in order to retrieve their belongings. Also, more than half of UCC students had not yet received their financial aid for the term—funds that many needed in order to eat and pay rent. The college needed help from administrators who understand student financial aid and the business practices of higher education to keep things running. As it is, the campus has been able to continue its mission of educating students. And that’s exactly what Le Duc is talking about when he speaks of making campuses more resilient. He has a vision for a future in which all schools in Oregon—kindergarten through graduate school—would have mutual aid agreements in place to help one another in the aftermath of emergencies and disasters. Le Duc is also hoping that other colleges, universities, and school systems in the state will follow the UO’s lead by training their employees so that they are better prepared to respond to crises on their own campuses or at other schools. At present, the UO is the only educational institution in the state that has an All-Hazard Type III Incident Management Team based on federal training guidelines. The team, which draws specialists from across the university, has completed more than 80 hours of training through the Federal Emergency Management Association. Team members meet monthly and regularly participate in practice exercises, and they are ready to drop their other work responsibilities to dedicate themselves to incident response. Many have also received training specific to the roles they would play in the event of an emergency. “In the case of Umpqua, our team was ready to deploy within a few hours, but unfortunately, UCC did not have a mutual aid agreement in place with us at the time of the shooting, so we needed to wait until we were asked to come to campus,” says Le Duc, noting that the protocol is that a team like his will not deploy at another institution until their help is requested. The UO now has such an agreement in place with UCC, as well as with several other universities nationally, and Le Duc is hoping that more schools in Oregon will soon sign these agreements. At the UO, Le Duc and colleagues plan responses to a myriad of scenarios that would take the university outside its normal operations—things like power outages, severe storms, fires, and even labor strikes. Their planning also helps the university prepare for major events like the US Olympic Team Trials in track and field, which will take place at Hayward Field in July. Le Duc’s team has been activated 18 times in the last two years, responding to such situations as winter storms and a meningitis outbreak. And the planning stems from the recognition that the university has very particular needs, and it needs to protect its academic and research activities.